You'll need a computer to conquer this one! 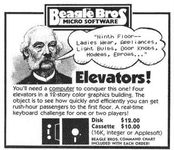 Four elevators in a 12-story color graphics building. The object is to see how quickly and efficiently you can get rush-hour passengers to the first floor. A real-time keyboard challenge for one or two players!